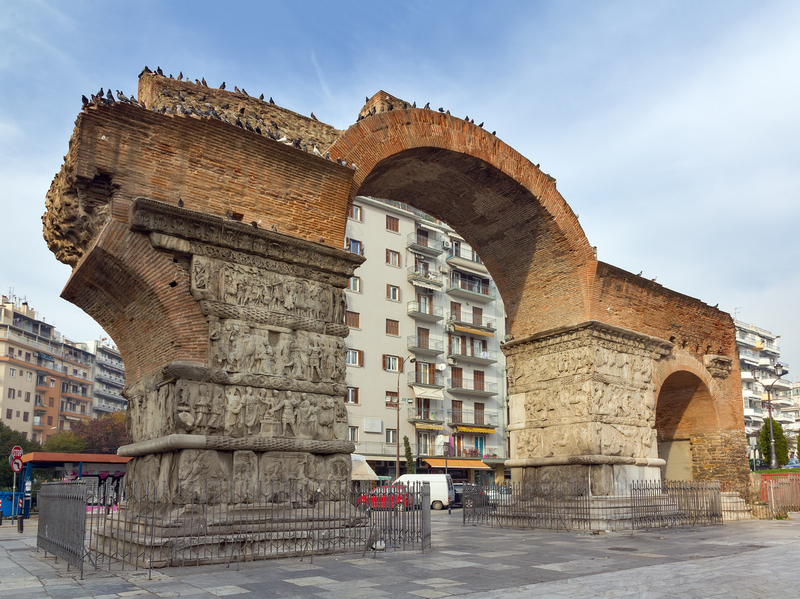 One of the most characteristic monuments of Thessaloniki is the triumphal Arch of Galerius (Kamara), located north of Egnatia Street and in close proximity to the Rotunda. The Arch was built in the period of the Roman Tetrarchy (early 4th century AD) and was the western part of an eight-pillared gateway. The triumphal gate was situated vertically to the ancient Via Egnatia, which ran through the city (from west to east) and was part of the so-called Galerian complex, which included Rotunda, along with the palace and the hippodrome in the contemporary Navarinou and Ippodromiou squares. The Arch of Galerius was built to honor the Caesar, when he returned victorious to the city after his wars against the Persians (ca. 306 AD). To this event are also related the relief representations on the pillars, still preserved to date. The scenes are arranged in four zones, one above the other, depicting Galerius’ triumphant welcome by the crowds outside the walls of Thessaloniki, battles between Romans and Persians or the Tetrarchs performing rituals. On the whole, the pictorial program was a celebrating tribute to the power and glory of the Tetrarchy and especially of Galerius. Apart from Kamara, there was another triumphal arch, located in the area of the contemporary Demokratias (Vardar) square, also at the vertical axis of Egnatia and near to the Byzantine "Golden Gate". This arch, which is not preserved today, was erected by the Thessalonians to honor Antonius and Octavius for their victory at the battle of Philippi (42 BC).